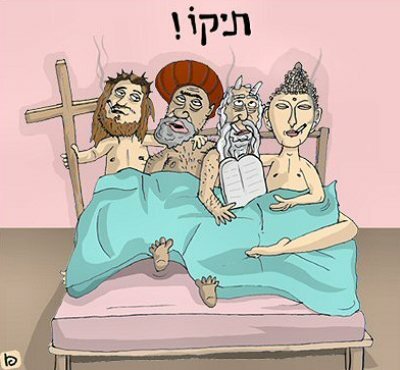 This month, the Israeli magazine Nana printed this provocative cartoon featuring a post-coital Mohammed in bed with Jesus, Moses, and Buddha, in a reference to the Jyllands-Posten Mohammed caricatures. 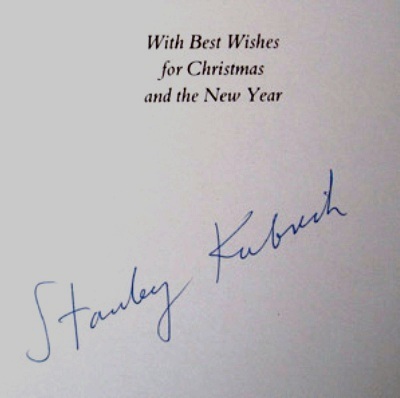 A genuine Stanley Kubrick signature (on a Christmas card, circa 1978), of which I'm now the very proud owner. 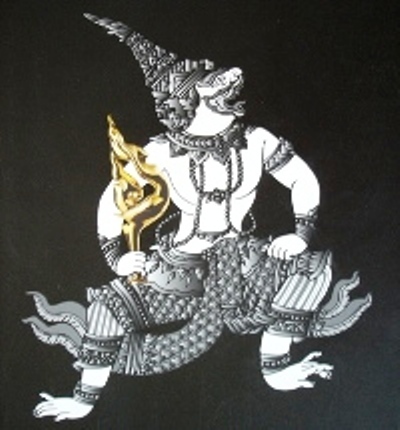 Nang Nak was a huge success in Thailand when it was originally released. Ring, from Japan, sparked the current pan-Asian horror obsession, though Nang Nak specifically launched a Thai horror revival - ever since, the most popular Thai films have been horror titles, usually with ghosts as central themes. Nang Nak is not especially scary, though it is highly emotional. It does have some brief horrific moments, however its main purpose is to show the depth of Nak's love for her husband. The script (by Wisit Sasanatieng, who has since become a great director in his own right) has rather simplistic dialogue: much of the film is taken up by Nak repeatedly crying her husband's name, perhaps in tribute to the classic TV version of the story. The director of Nang Nak, Nonzee Nimibutr, is practically single-handedly responsible for the international attention Thai cinema is now receiving, as director of 2499 and Nang Nak and producer of Bangkok Dangerous, Tears Of The Black Tiger, Monrak Transistor, and Last Life In The Universe. Nonzee could justifiably be called the godfather of the Thai 'new wave'. 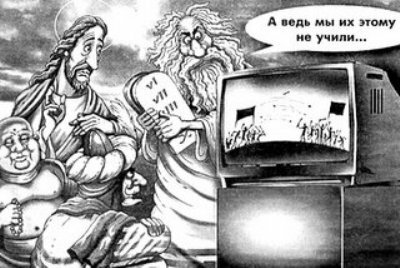 The Russian newspaper Gorodskiye Vesti has been closed down after it published a pacifist cartoon featuring Mohammed, Buddha, Jesus, and Moses yesterday, in a reference to the Jyllands-Posten Mohammed caricatures. In Les Diaboliques, a sadistic headmaster, Michel, runs a dilapidated school alongside his (literally) weak-hearted wife, Nicole, and his butch mistress, Christina. The two women take solace in each other, and there are hints that they are lovers themselves. Michel seems to mistreat both women, though he reserves most of his cruelty for Nicole, forcing her to eat the rotten fish he serves as a school dinner. Les Diaboliques is extremely Hitchcockian, with its convoluted murder plot, a naturally suspicious policeman, and high suspense. In fact, Alfred Hitchcock was reportedly concerned that director Henri-Georges Clouzot had stolen his thunder. The novelists Boileau-Narcejac, who wrote Celle Qui N'Etait Pas (the basis for the film), followed it with From Among The Dead, written specifically to appeal to Hitchcock's sensibilities; he took the bait, and based Vertigo on their novel. His film Psycho was perhaps an attempt to up the ante and confirm/reassert his position as 'master of suspense'. 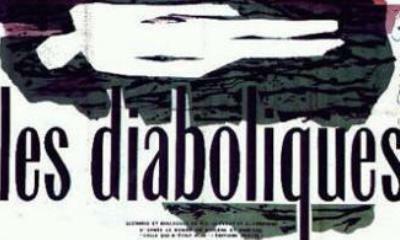 Les Diaboliques climaxes with one of the most famous suspense sequences in horror cinema. At the end of the film, a caption-card urges the audience not to spoil it for future viewers by revealing the final twist (just as lobby posters later implored audiences not to reveal the ending to Psycho). Suffice to say that contact lenses are utilised to disturbing effect, and anyone who has seen the lurid bathroom scene in schlock classic The Tingler will recognise identical character motivations and a similar modus operandi. Today's International Herald Tribune newspaper includes a cartoon by Patrick Chappatte which features a drawing of Mohammed. 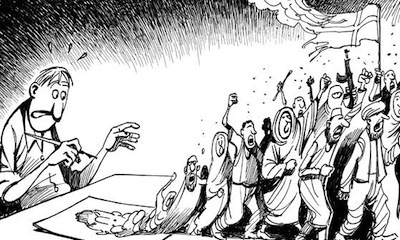 Chappatte's cartoon is a commentary on the protests resulting from the twelve Jyllands-Posten Mohammed caricatures. 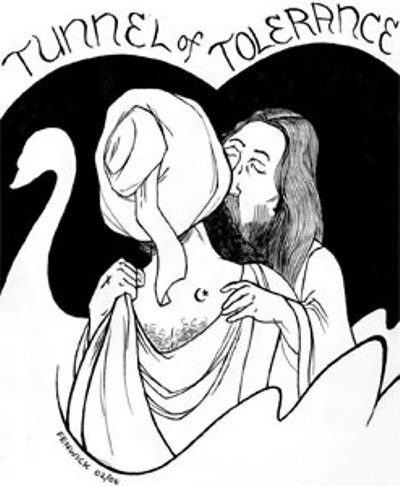 Today, The Strand, a magazine published by Victoria University in Canada, printed a provocative cartoon featuring Jesus kissing Mohammed, in a reference to the Jyllands-Posten Mohammed caricatures. As I've said before, 200 films is a reasonable list - not too long, not too short. Empire's list of 201 has enough space for many films ignored in traditional top-100 lists (La Haine, Casino, and Dawn Of The Dead, for instance). However, at only 5%, foreign-language films are still hugely under-represented. There is also a strong bias in favour of recent releases, remakes, and sequels. Is it really necessary to have two Star Wars films and two Lord Of The Rings films so high up the list, and why include the Scarface remake yet exclude the original version? Some Like It Hot is the 1959 comic masterpiece, not the obscure 1939 comedy. Note also that Crash is the Paul Haggis Oscar-winner, not the scandalous David Cronenberg film, and Titanic is the James Cameron version. There have been many adaptations of Romeo & Juliet; this one is the Baz Luhrmann version. 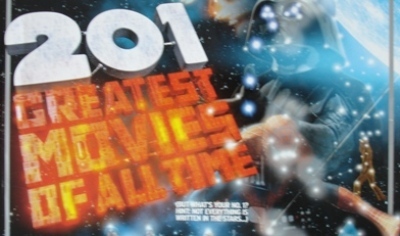 A handful of the highest-placed films in this poll have ranked in similar positions in other recent polls, and we can compare the new list with previous Empire polls (100 Favourite Films Of All Time, 1996; Your 100 Greatest Films Ever!, 1999; The 50 Best Films, 2001; 100 Greatest Movies Of All Time, 2004). For example: Pulp Fiction (1996: #1, 1999: #6, 2001: #10, 2004: #7, 2006: #6), Star Wars IV (1996: #2, 1999: #1, 2001: #1, 2004: #2, 2006: #4), The Lord Of The Rings I (2004: #1, 2006: #3), and The Shawshank Redemption (1996: #53, 1999: #4, 2001: #3, 2004: #5, 2006: #1). Thus, perhaps a new canon is forming. 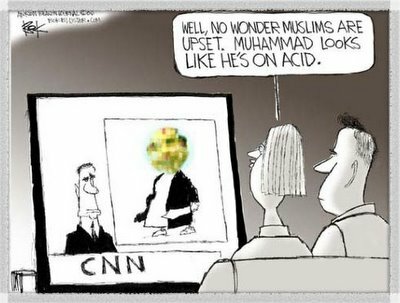 American newspaper Akron Beacon Journal published a pixelated Mohammed cartoon on 5th February, in a comment on the American media's refusal to present the Jyllands-Posten caricatures uncensored. 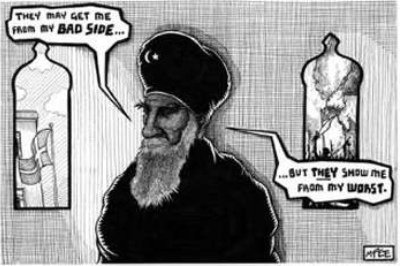 The Daily Tar Heel newspaper, published by the University of North Carolina, today published this Mohammed cartoon in a reference to the Jyllands-Posten Mohammed caricatures. 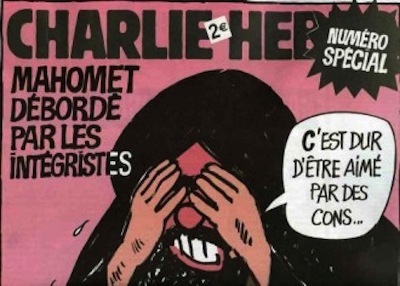 Charlie Hebdo, the French satirical newspaper, is currently being sued by the Grand Mosque of Paris and the Union of French Islamic Organisations. Its 'crime' was to print a special issue in support of the Jyllands-Posten Mohammed caricatures yesterday, and to create a new one on the front page (featuring a sobbing Mohammed, sad that he is "loved by idiots"). The cover image is by Jean Cabut, known as Cabu. On the back page, Mohammed is represented as a skull (rather tastelessly) and, in a pastiche of Rene Magritte by Loic Schvartz, as a pipe. Inside is caricature of a laughing Mohammed by Georges Wolinski. A cartoon by Philippe Honore depicts Mohammed as a series of objects, as Weekendavisen did last year. Laurent Sourisseau, known as Riss, portrays Mohammed as a president. Bernhard Verlac, known as Tignous, has recreated Jyllands-Posten's most infamous cartoon, of Mohammed with a bomb in his turban. 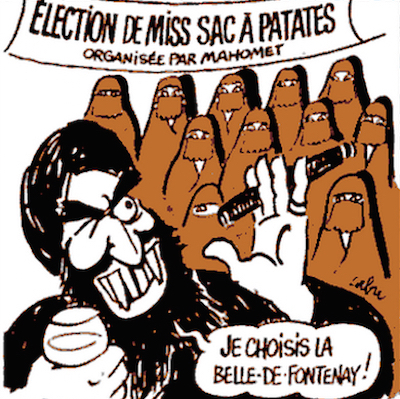 A previous Charlie Hebdo cartoon of Mohammed, from the 27 November 2002 issue, did not cause any particular controversy. The cartoon, by Cabu, featured Mohammed as the judge of a beauty contest. 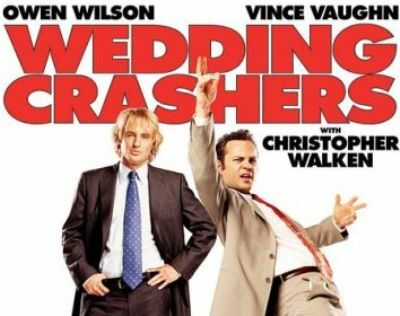 I've been carefully avoiding the so-called Frat Pack comedies but this week I saw David Dobkin's Wedding Crashers and was pleasantly surprised that the humour was subtle rather than gross-out. It's a Frat Pack film because its two leads (Owen Wilson and Vince Vaughn) are both leading members of the Frat Pack group, and it has a traditional cameo by Will Ferrell, though it actually seems more like a romantic comedy. It's as formulaic as any other romantic comedy, and at no point were my sides in any danger of splitting. Wilson, however (whose character has more depth than Vaughn's), seems like a surprisingly impressive actor. 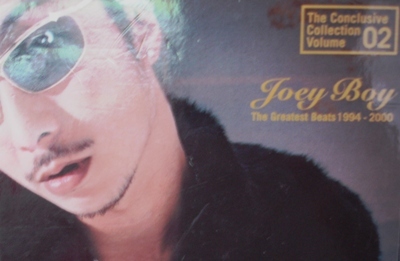 Thai rapper Joey Boy has issued a profuse apology after it was discovered that a verse from the Koran was inadvertantly included in one of his songs. The song in question, Maya, was first released on the 1998 album Bangkok, and was also included on last year's greatest hits album The Greatest Beats. The earlier album is already deleted, and The Greatest Beats will now be withdrawn because of the protests against Maya. Why is it necessary for him to apologise and withdraw the record? If the Koran (or the Bible, for that matter) is quoted in a rap song, what's the big deal? A Thai Muslim group has complained that it is disrespectful to quote the Koran out of context, but Joey Boy is not a Muslim, so why should he be required to treat the Koran as a sacred text? 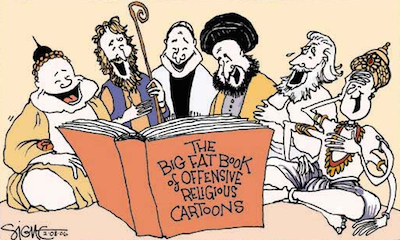 Today's edition of the Philadelphia Daily News features a cartoon by Signe Wilkinson depicting various deities, including Mohammed, reading a book of offensive religious cartoons. The cartoon is a reference to the twelve Mohammed caricatures published by Jyllands-Posten last year. Cache, by Michael Haneke, is thought-provoking, complex, and highly ambiguous. It begins with a long, static shot of a nondescript urban house, which is later revealed as footage from a surveillance camera. Videotapes of similarly covert recordings are sent anonymously to the owners of the house, Georges and Anne. It becomes clear that the sender knows Georges well, as the tapes hint at guilty secrets from his childhood. One of the tapes identifies the location of a suburban apartment, and Georges visits it in order to investigate the source of the videos. When he arrives, he finds Majid, an Algerian orphan whom he had victimised when he was younger. Cache has no music score, and the resultant silence emphasises otherwise trivial sounds, such as doors closing and cutlery clinking. Many scenes are filmed in long takes with a static camera - several sequences are identified as surveillance video footage, and the remainder may either be actual videos or simply scenes that resemble the videos. Deception and betrayal seem to be recurrent themes. Georges is in denial (to himself, his mother, and his wife) about his childhood cruelty towards Majid (revealed in a flashback in which he beheads a chicken). Accusations are frequently made, and we cannot ascertain which statements are true and which are not. On the surface, the film's central question is: who is making the videotapes? Majid convincingly denies it, as does his son (perhaps less convincingly). The film's final shot provides an explanation or clue of sorts if you look closely, though it doesn't feel completely satisfactory. Many questions are left unanswered. Why does Georges's boss seem so sinister? Who are the mysterious friend and his mother that Georges's son stayed with? What is the full extent of the childhood rivalry between Georges and Majid? Does Georges commit suicide at the end, or merely take sleeping pills? If Majid's son did record the tapes, why does he continue to deny it? Like Haneke's earlier Funny Games, Cache is a story of bourgeois domestic complacency invaded and destroyed. In this case, there is also a racial subtext to the narrative, as Georges is presented as a repressed pseudo-intellectual with thinly-veiled racist attitudes. The central conflict between Georges and Majid can be taken as a commentary on contemporary France's reluctance to acknowledge its racial minorities (a theme explored explosively in La Haine). War footage from Algeria is played on TV screens at several points, though the central characters are always tellingly oblivious to it. Aside from the subtext of racial tension and bourgeois indifference, there are also excellent performances by Daniel Auteuil (Georges), Juliette Binoche (Anne), and especially Maurice Benichou (the emotional Majid). Its unresolved narrative makes a second viewing essential. Last month, I watched Touch Of Evil, the last of the original film noir cycle. 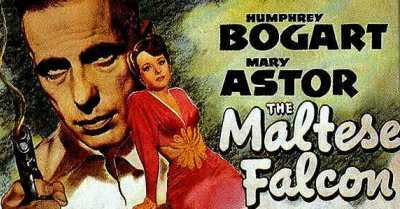 Yesterday, I saw the first in the cycle, The Maltese Falcon, by John Huston (a remake of an earlier film by Roy Del Ruth). Humphrey Bogart stars as Sam Spade, the first of his definitive noir detective roles. (He later played Philip Marlowe in The Big Sleep.) This was Bogart's first top-billed (anti-)heroic performance, after previously being typecast as a villain in supporting roles. What makes Bogart's character so interesting is his moral ambiguity: he seems prepared to sleep with his business-partner's wife, then to reject her once she is widowed. Like Rick Blaine, Bogart's character in Casablanca, Spade's alliances appear to shift, until his cynical, self-protecting facade disappears when he puts love aside to do the right thing. There are also other Casablanca connections: along with Bogart, Sydney Greenstreet and Peter Lorre also feature in both films, in similar roles. Lorre, a major star in Germany before World War II, played sinister villains in numerous noir thrillers. He is perfect as the gardenia-scented Joel Cairo, twisting a phallic walking-cane and even putting its tip to his lips. Greenstreet is wonderful as Kasper Gutman, an amiable sugar-daddy, constantly chuckling to himself. He would develop further comic mannerisms for Casablanca, such as his obsession with casually swatting flies. Elisha Cook has an unbilled supporting role and, as always, plays the unlucky fall-guy. I've always had a soft spot for films featuring Lorre and Cook together, because they're two of my favourite character actors. They both previously appeared in Stranger On The Third Floor, and that film has sometimes been cited as the first true noir. Stranger On The Third Floor has more shadows and Expressionist lighting than The Maltese Falcon, so it certainly looks like a noir film, though it was The Maltese Falcon that established the archetypes of the noir form. The cynical detective, the duplicitous femme fatale, and the ambiguous morality of The Maltese Falcon formed the basis of many subsequent noir thrillers. The film's dialogue seems more authentic than the contrived innuendo of The Big Sleep. Also, Bogart is amazingly fast with his lines - his quick delivery makes this performance more energetic than the world-weary characters he played in other films of the period. It's a largely studio-bound film, though the sets all have ceilings to create a claustrophobic atmosphere and increase the tension. The Maltese falcon itself, a bejewelled statuette, is merely a MacGuffin - a plot device intended to motivate the central characters. In a line adapted from The Tempest, Spade calls it "the stuff that dreams are made of." 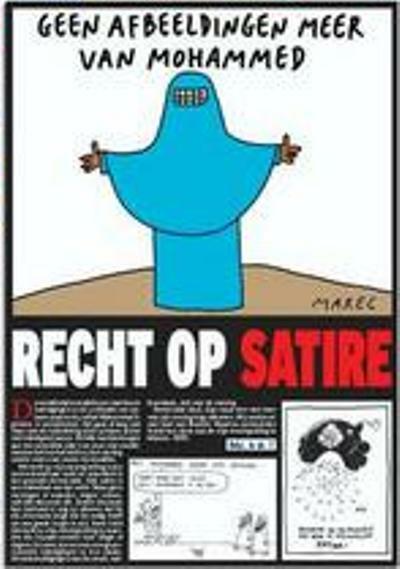 Belgian newspaper Het Nieuwsblad published a Mohammed cartoon on its front page today, featuring the prophet wearing a blue burqa as a disguise. It also transformed one of the original Jyllands-Posten caricatures into a dot-to-dot puzzle. 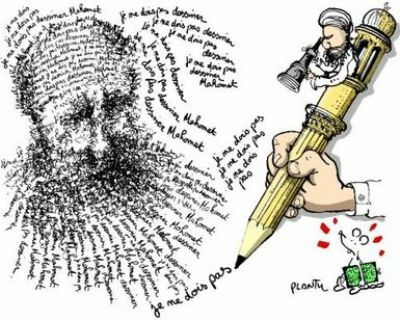 Le Monde published a clever Mohammed cartoon on its front page today, in which a cartoonist's mantra "I must not draw Mohammed" forms a representation of the prophet himself, in a reference to the Jyllands-Posten Mohammed caricatures. The cartoon is by Jean Plantureux, known as Plantu. 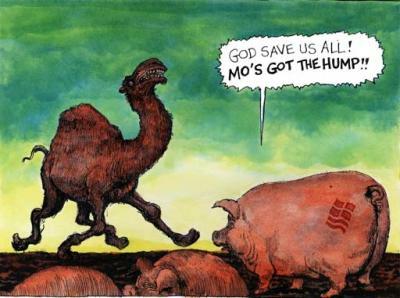 Today, The Guardian published a cartoon by Steve Bell [my favourite cartoonist, incidentally], which represents Mohammed as a camel, in a reference to the Jyllands-Posten Mohammed caricatures. 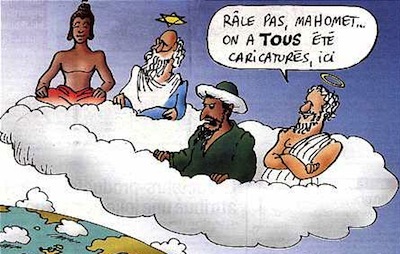 A front-page cartoon in today's France Soir newspaper features a row of deities sitting on a cloud, with God consoling Mohammed: 'we have all been caricatured'. The paper's managing director has been sacked as a result. The cartoon is a reference to the Jyllands-Posten Mohammed caricatures.